You can easily locate north, while traveling at night, by locating the Big Dipper. You must be in the northern hemisphere with a clear view of the night sky. The Big Dipper never sets below the horizon. The Big Dipper rotates around the north star (Polaris) and is visible in northern skies all the year round. The Big Dipper is called Ursa Major (Great Bear in Latin). The Big Dipper is used to find the North Star, which is called Polaris or the polestar. 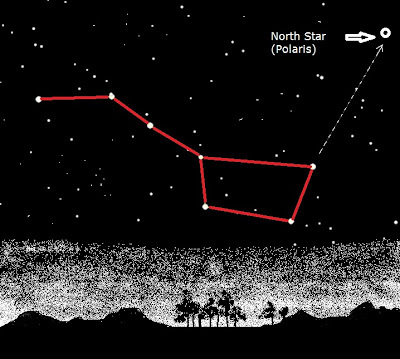 The North Star forms part of the Little Dipper handle and can be confused with the Big Dipper. The Big Dipper is a seven star constellation in the shape of a dipper. The two stars forming the outer lip of this dipper are the "pointer stars" because they point to the North Star. Mentally draw a line from the outer bottom star to the outer top star of the Big Dipper's bucket. Extend this line about five times the distance between the pointer stars. You will find the North Star along this line. The north star is the last star in the little dippers tail. Try to pick out a landmark directly under the North Star to use for navigating.